Chris James on how simple computer models can make specifying cooling systems as easy as pie. 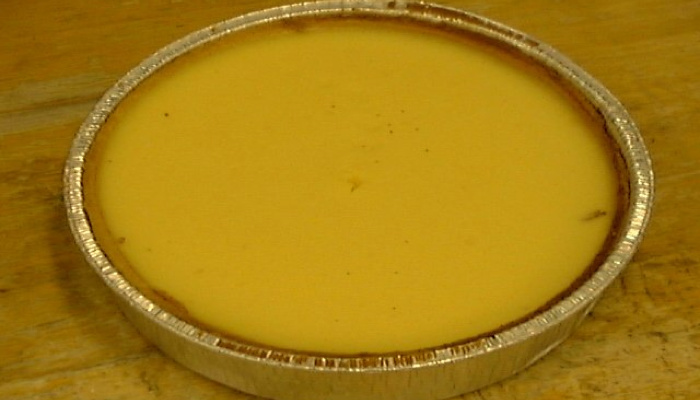 Optimising cooling systems for baked products such as cheesecakes, Tart citrôns, apple pies, etc can be a very expensive, time consuming, activity. Such products are made up of layers of biscuit, fillings and pastry of substantially different thermal properties. All these properties tend to vary with temperature. If the requirement is to cool to a maximum internal temperature then experimentally locating the position of the warmest place is itself difficult. Multi-point temperature sensors will often disturb the temperature profile being measured. Positioning an array of thin wire temperature sensors in known positions in an uncooked batter is an art in itself. If the requirement is to cool to a final ‘average’ temperature then the problem is no easier. We would define the ‘average’ temperature of the product as the temperature it will equalise to if no further heat enters or leaves the product. In multi-layer cakes with temperature variable properties it is certainly not the mean of all the temperatures measured at a certain time. An estimate of the average temperature can be obtained by taking products out of the chilling system at set times and placing them in a vacuum flask. By monitoring the temperature of the product in the flask an idea of the average temperature can be obtained. However, you need a great number of products, much effort and some time before one curve of average temperature against time can be obtained. After many weeks, if not months, of experimental effort you may have identified the conditions or sets of conditions you require to cool your cheesecake. Now you just repeat the procedure for all the other products that you would like to cool in the same system. Finished? Well not quite. The refrigeration contractor, would like to know how much heat they have to extract from the products? Also, what is the rate of heat removal required in the different stages? Computer modelling is a proven solution to such problems. 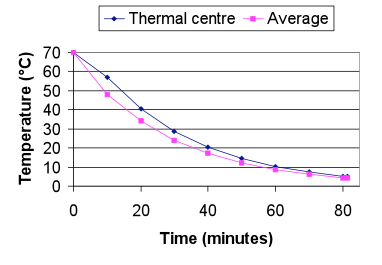 Finite difference models (such as FoodTempX developed at FRPERC) will simply and speedily predict heat flow through multi-layer products. From a few simple experimental runs under carefully controlled conditions, finite difference models can be easily configured for the product of interest. The program then calculates the thermal profile through the product with time. This allows the correct position of the thermal centre to be identified and a cooling curve at the thermal centre and the average temperature with time to be produced. Additionally the Enthalpy change can be produced allowing heat loads to be calculated, of great use to Refrigeration Engineers for identifying plant requirements. 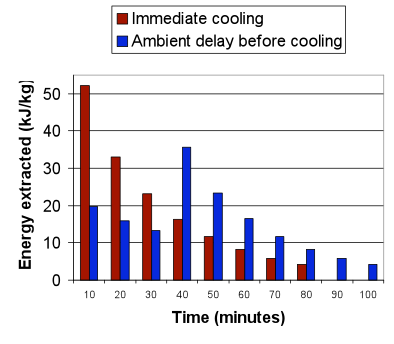 An example of such data is shown below. Modelling allows you to look at may “what if” scenarios. For example, what would be the affect of an initial ambient cooling phase? In this particular case it would extend the cooling time from 80 to 100 minutes, as shown below. 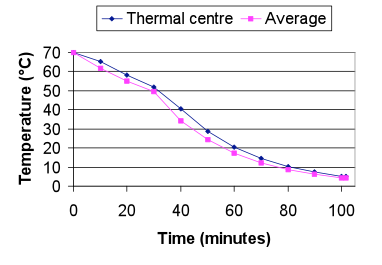 However, it would also reduce the peak refrigeration heat load to be extracted by 30%, as shown below.